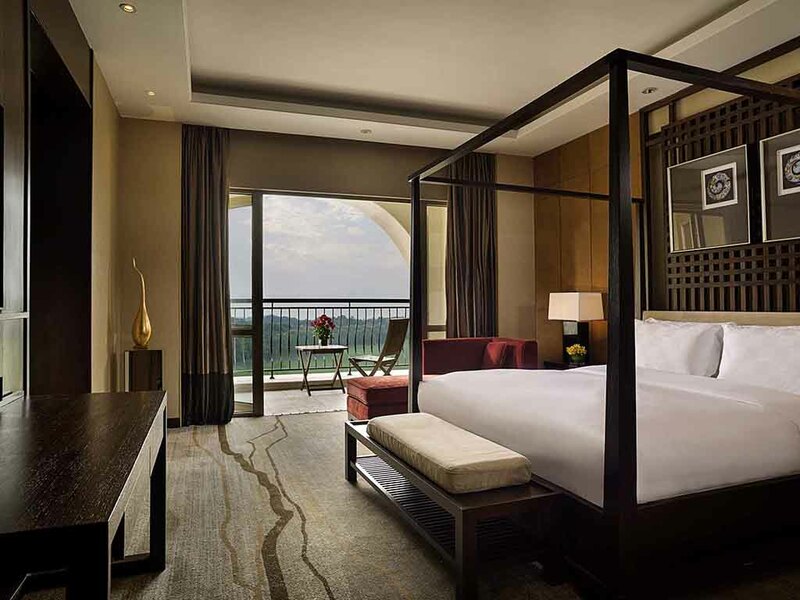 With the unique natural scenery, Sofitel Nanjing Zhongshan Golf Suning located at the piedmont of Zijin Mountain is the natural oxygen bar of the city where tranquility and rejuvenation begin. Surrounded by The 27-hole golf course designed by the world famous international renowned golf course designer Gary Player, the hotel owns gorgeous scenery. There are 250 guestrooms altogether including 114 guestrooms with great golf course or garden view. You will not only indulge in the elegant and luxury French atmosphere, but also be impressed by the most frontier elements within the hotel. Well-appointed guestrooms greatly show the luxury and cozy features. State-of-the-art ballrooms, multi-functional meeting rooms, various restaurants, recreation facilities and personalized services make it the best choice for business and recreation. Surrounded by The 27-hole golf course and owns a gorgeous scenery. With the unique natural scenery, the resort is the natural oxygen bar of the city where tranquility and rejuvenation begin. 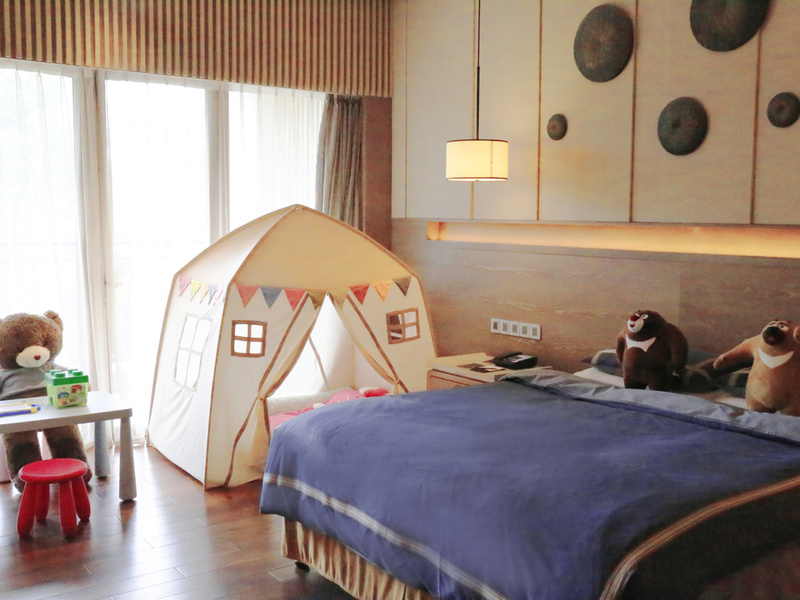 Cartoon-themed family rooms are well-fitted for families. Each Sofitel is a unique blend of the French art de vivre and local refinement. Set at the foot of Zijin Mountain's stunning slopes, Sofitel Nanjing Zhongshan Golf Suning invites you to revitalize and relax in the city's natural oxygen bar. The regal design of this 5-star luxury hotel captures the essence of French style. With artistically landscaped gardens, this veritable château holds court amidst acres of rolling golf greens. It is the perfect marriage of East meets West. 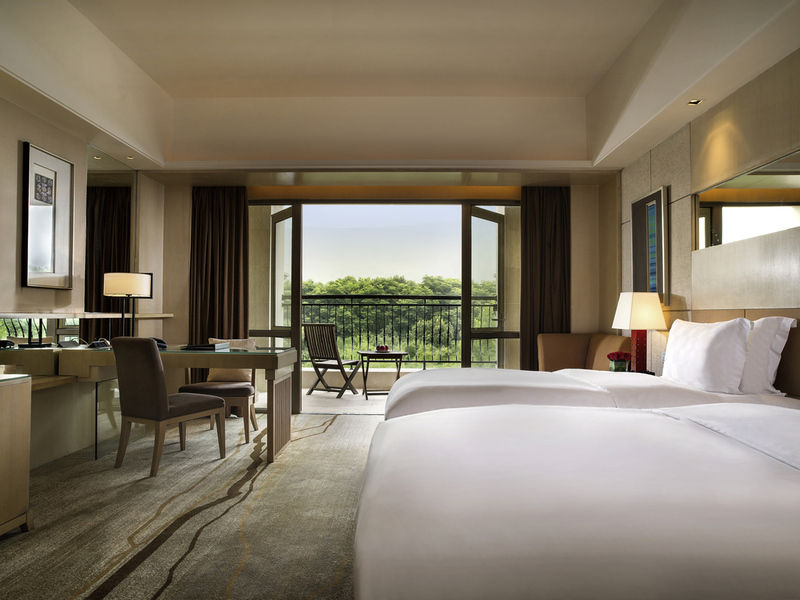 Just as mystical purple clouds envelop the surrounding peaks at dusk and dawn, Sofitel Nanjing Zhongshan Golf Suning embraces Chinese tradition. Partake in a daily candle ritual, savor local cuisine and enjoy regional festivals in a striking setting. We invite you to soothe your senses in our luxurious spa, a peaceful sanctuary that brings together ancient Chinese traditions and 5-star beauty therapies. After indulging in a blissful healing massage, retreat to the sauna for a moment of tranquility. Embrace the tranquility of Zijin Mountain and enjoy its unique natural surroundings. 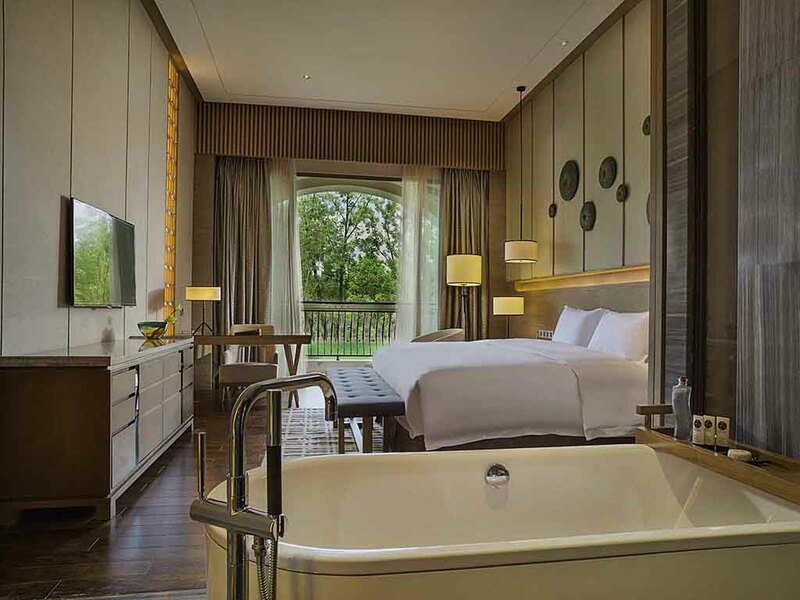 All guestrooms are equipped with high-speed Internet connectionin, plasma television, satellite TV channel, wet separation design in bathroom, Lanvin amnities and dependent balcony. Sofitel's unique "My Bed" provides guests a perfect sleeping experience. 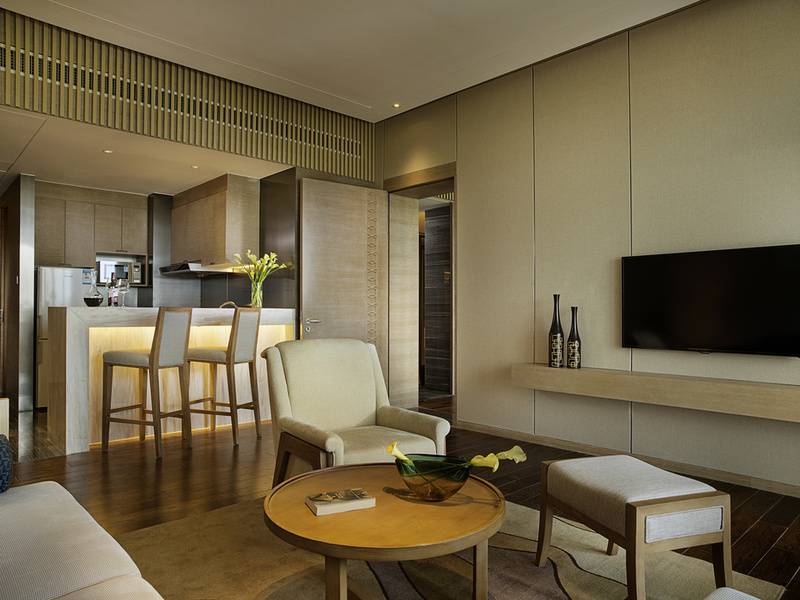 The luxury suite ranges from 85 to 815 m² and guests will enjoy the golf course or garden view here. All suites are equipped with separate living room, Sofitel Hollywood bed, walk-in closet, Bose/Philips sound system and computer-sized electronic safe. Purple Mountain view, 650 sq.ft. (60m²), balcony, 50" plasma screen TV, broadband Internet access and separate rain-style shower. Up to 2 adults and 1 child. Purple Mountain view, 650 sq.ft. (60m²), balcony, 50" plasma screen TV, broadband Internet access and separate rain-style shower. Up to 2 adults and 1 child. Garden or Golf View, 650 sq.ft. (60m²), balcony, 50" plasma screen TV, broadband Internet access and separate rain-style shower. Up to 2 adults and 1 child. 860 sq.ft. (80m²), large balcony, outdoor furniture, Sofitel MyBed, 50" plasma screen TV, broadband Internet, Club Sofitel access and separate rain-style shower. Up to 2 adults and 1 child. 645 sq.ft. (60m²), balcony, 50" plasma screen TV, broadband Internet access, separate rainforest shower, cartoon-themed setting and decoration, toys and games, welcome gift for kids, all-day kid's menu, including 2 adults and 1kid buffet breakfasts. 1080 sq.ft. (100m²), balcony, Sofitel MyBed, 50" plasma screen TV, broadband Internet, separate living room, Club Sofitel access and separate rain-style shower. Up to 2 adults and 1 child. 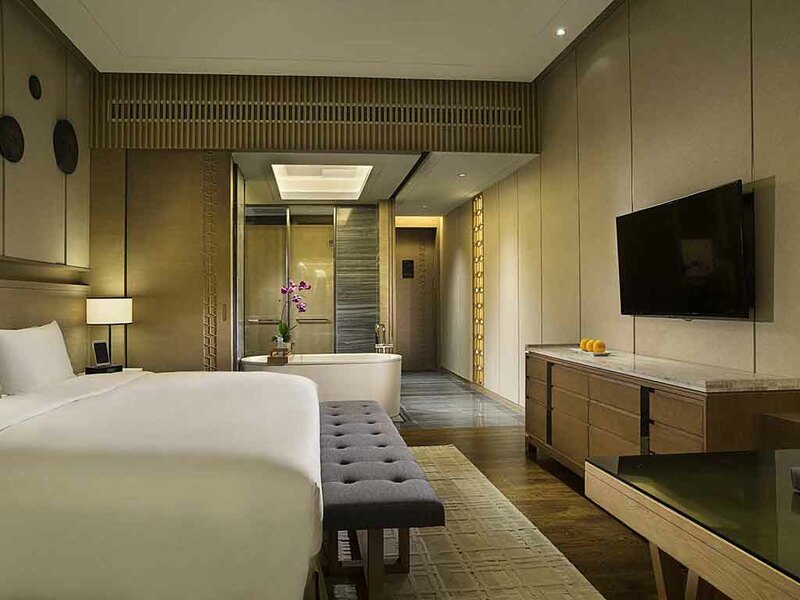 Guests staying in suites and club rooms enjoy not only the most luxurious accommodation at Sofitel Nanjing Zhongshan Golf Suning but also a wealth of exclusive privileges and complimentary services. The Sofitel Club Millesime welcomes guests with attentive personalised service, private breakfasts, evening cocktails, complimentary all-day refreshments and a variety of in-lounge and in-room benefits throughout their stay. Our in-room dining service caters to your needs. No matter the time, order from our extensive menu offering a selection of Chinese and Western dishes. An ideal place for casual or business gathering with mordern characteristics and golf view. Featuring innovative Huaiyang-stylecuisine, Sichuan and Cantonese specialties. Enjoy live cooking at its best in this vibrant restaurant featuring Asian and Western cuisine. Follow the enticing aromas to Wild Fire and savor juicy cuts of meat grilled to perfection. Traditional and popular Huaiyang-style cuisine. Provides Huaiyang, Sichuan and Cantonese food. Enjoy live cooking at its best in this vibrant restaurant featuring Asian and Western cuisine. The Lobby Lounge serves drinks in a relaxing atmosphere with a beautiful view over the golf course. With the decoration style of very modern characteristics. An ideal place for friends' gathering and chatting. With 1,400m² pillar-less space and 7 meters high ceiling, state-of-the-art equipment, vehicle driving directly to enter the stadium, the elegant and versatile Zhongshan Grand Ballroom makes all events unforgettable. 6 multi-functional rooms, from 150m² - 450m², all well-equipped with advanced facilities: audio visual equipment, central air-conditioning system, high-speed WIFI and Internet connection, customized coffee break, etc. Located besides the golf course and tree-lined Hunaling Road, and infused with French elegance, The Garden is designed for a variety of high profile weddings, auto shows, ceremonies and commercial activities. 2 pillar-less Ballrooms with an area ranging from 450 to 1400 m². The Garden outdoor venue covers an area of about 12,000 m². Waterscape Stage, Zhongshan Pavilion and the French-style pavilion are novel choices for outdoor weddings. The elegant and versatile Zhongshan Grand Ballroom makes all events unforgettable. The Sofitel signature Cousu-Main service and unique dining environment will ensure you an unforgettable wedding experience. Guests could choose western or traditional wedding banquet in both outdoor or indoor venue. The wedding menu is customized according to personal preference. All rooms are equipped with advanced lighting system, electronic audio visual equipment, center air conditioning and WIFI/high speed network connection. There are 250 guestrooms altogether including 114 guestrooms with great Golf Course or Garden view. The spacious and decorated wedding room bring your relaxation and pleasant enjoyment to your heart and body. The hotel is located in the peaceful Purple Mountain Scenic area beside the Nanjing Zhongshan International Golf Course.The hotel banquet building is located at the west side of the hotel main building with exclusive indoor and outdoor parking area. 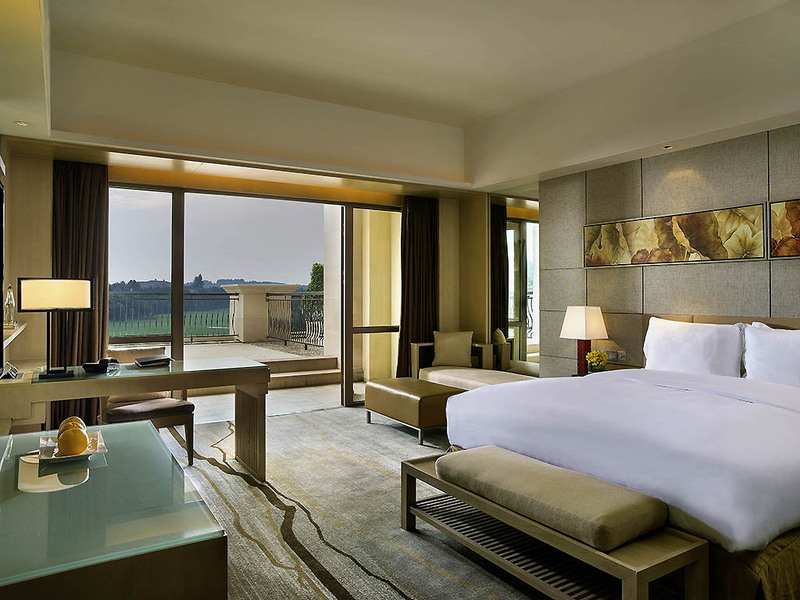 All rooms at Sofitel Nanjing Zhongshan Golf Suning can be transformed into honeymoon suites upon your request. There is nothing our creative staff enjoys more. Just let the hotel know in advance and we will set the mood for romance. Hotel facilities include well-equipped gym, heated swimming pool, outdoor tennis court, CrossFit zone, yoga and pilate studio, kid's villa, spa area etc.. You will enjoy staying here and have a very joyful living experience! Visit the nearby Sun Yat-sen's Mausoleum Scenic Spots including Ming Tomb, Linggu Temple, The Purple Mountain, Qixia Mountaion and the magnificent Xuanwu Lake. Tell us your interests and let us arrange a pleasure trip for you. Nanjing was the ancient capital for six dynasties. Please contact: 025-8540 8888 ext 8002. When it comes to your automobile needs, we provide you with premium chauffeured service on request. Travel in comfort and style in one of three types of vehicles: a 6-seater Buick van, a 4-seater Volkswagen or a 19-seat Toyota coaster. Artistic mood lighting creates a subdued ambience around our indoor heated pool. Retreat to this peaceful sanctuary and immerse yourself in the soothing water of the Jacuzzi after a busy day, or recline on a lounger and feel the sun washing over you. 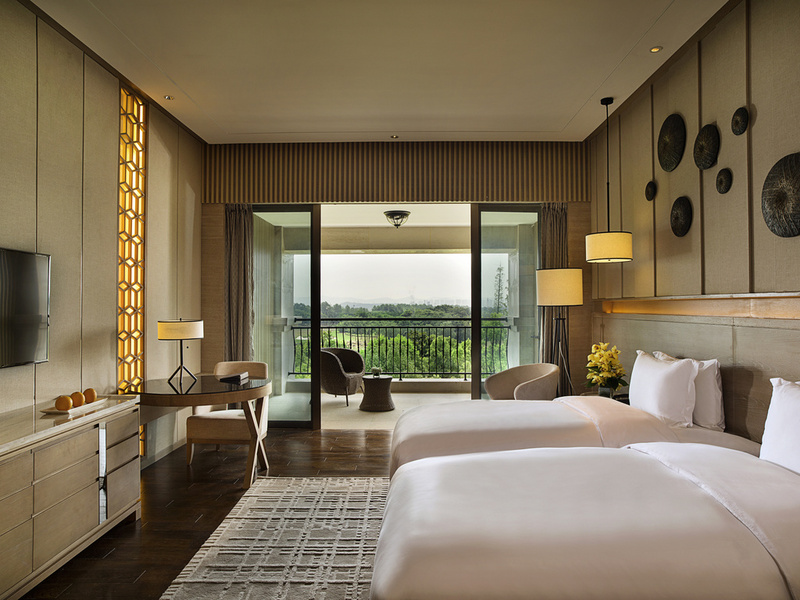 Surrounded by The 27-hole golf course designed by world famous international renowned golf course designer Gary Player, Sofitel Nanjing Zhongshan Golf Suning owns a gorgeous scenery, it is also like a natural reserve of rich oxygen within the urban city. Hotel facilities include well-equipped gym, 25-metre heated swimming pool, 75cm deep children's swimming pool, indoor kid's zone, outdoor kid's corner, outdoor tennis court, CrossFit zone, yoga and pilate studio.